Calaméo - Forex Trading Systems - How Well Do They Work? Forex Trading Systems - How Well Do They Work? 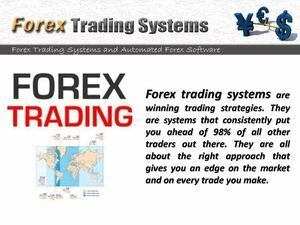 Forex trading systems are winning trading strategies. They are systems that consistently put you ahead of 98% of all other traders out there. They are all about the right approach that gives you an edge on the market and on every trade you make.